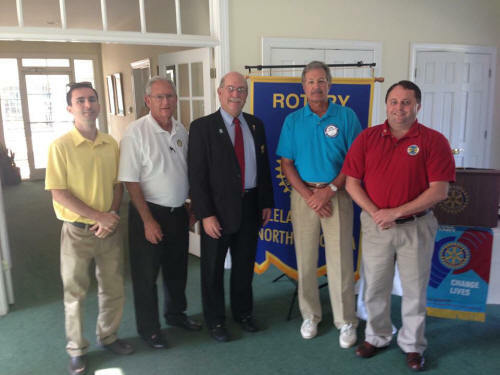 Pictured Left To Right: President-Elect Michael Braddock; President Clyde Queen; District Governor Andy Chused; Past President George Murray; Past President Frank Williams. August 2, 2013 - Leland, NC - Rotary District 7730 Governor Andy Chused was the featured speaker at the Leland Area Rotary Club meeting on Thursday, July 25, 2013. The Leland Area Rotary Club was chartered in early 2010 and serves northern Brunswick County, N.C. Rotary is an organization of business and professional leaders united worldwide who provide humanitarian service, encourage high ethical standards in all vocations and help build goodwill and peace in the world. Rotary club membership represents a cross-section of the community�s business and professional men and women. The world�s Rotary clubs meet weekly and are nonpolitical, nonreligious, and open to all cultures, races and creeds.